"Run with your reptilian brain, run with your reptilian brain." These were the only thoughts I could manage. 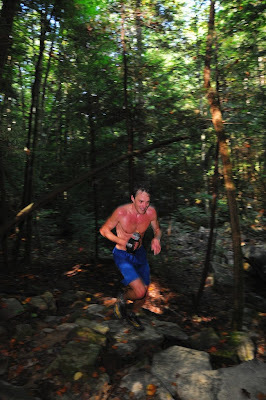 It was 25 miles into the race, and I was facing 6 more--which happened to be uphill, up a mountain. Not so bad: this is what I'd signed up for. What was bad was that I didn't have any more sugar in my system. Glucose, they call it, is the sweet fuel that is the material condition of all those thoughts running through your brain. And it had all been burned out of my system in the previous three hours of rocks, roots, hills, trail. Before that point, the race had gone exceptionally well. Running with long-time friend Andy, we had maintained a steady effort at around 4:10 pace, letting three runners go off the front. At the first check in, 6 miles into the race, they had a 5 minute lead on us--but we were at 4:00 pace. Either they were running 3:30, or they'd be coming back quick. Rolling into Indian Rockhouse the first time. At the next check in, mile 11 or so, their lead was down to three minutes, and we felt strong. Running steady, chatting easily, we rolled on. About 45 minutes later--right around the halfway point of the race, we caught Bryan Dayton and eventual winner Josh Wheeler. The hot early pace had clearly affected Bryan, as he dropped off. Josh was energized by our presence, and he charged ahead. Andy and I grinned--he'll be coming back. It's a long race--be steady. Through the rock garden. Was I red from a yellow jacket sting? At the next aid station, mile 20 or so, Jamie Dial helped me fill my water bottle with powerade, and I charged ahead. It was a little more than 4 miles downhill to the next aid station. I was feeling great in the legs, but each sip of powerade made me nauseated. I was cruising pretty good, but began to lose peripheral vision a bit. My nausea increased. The world slowly receded. I was alone on the trail, suddenly heedless of everything, only the steady pace, the rocks, a rising sense of dread. Then, the aid station at mile 25. All I wanted was water, as my nausea was intense. What I should have done here was stop and eat and get my glucose levels back up. But of course, they were so low that I wasn't thinking coherently. I was in third by a good margin--I had it locked down. But for some reason, I just rushed through the aid station, taking only water. The needle was on empty. I was at the bottom of the mountain, six miles to go. It was a hugely long six miles. The only thing that kept me going was the thought of the finish line. About halfway home or a bit more, Bryan Dayton came by me. I gamely tried to hold him off for a few minutes, but that was mere instinct. I had nothing. When I was running, it was maybe 10 minute pace. When the hills were steep, I would walk. The last few miles cruelly circles the finish line. It's always just around the next bend. But never there. Never there. Never there. Then, finally, the road and the parking lot. I was pretty incoherent as I crossed the line. My dear wife brought me a cool rag, fed me cookies and water. Andy came across cheerfully 10 minutes later and peeled me a couple of oranges, which finally revived me. 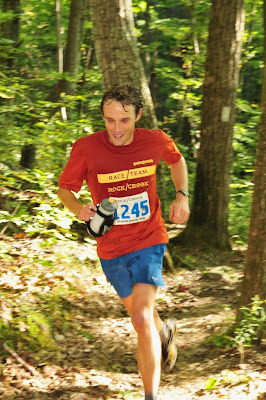 Did I underestimate the difficulty of running 50k on tough trails? Perhaps. I definitely didn't put enough attention towards my nutrition. The winner, Josh, ran a great race, setting a new course record at 4:15, running down Nick Selbo over the last 6 miles. As is always the case with Rock/Creek events, the volunteers, the race coordination, the other racers, were exceptional. After the race, I had fried chicken with family and friends. That hit the spot. The legs are still sore today, but I think I'll be ready to run a bit this afternoon. A lot about this race went right, and I'm proud of finishing the dadgum thing. It was a lot harder than last week's 5k PR. Last week I pushed back my limits a bit. This week, I stepped over them entirely. What sort of runner am I? The one able to run three 5 minute miles back to back, then charge tirelessly to the finish line? Or the one unable to sustain a 10 minute per mile jog? Am I a philosophy professor, comfortable amid the most abstract concepts? Or a reptile, scooting without purpose, without any higher thought, across the broken ground? Yuck, that's a bad place to be. Hopefully your write up will save someone else from making the same mistake. I am a long distance runner, so i can somewhat relate to your craze! However, i know that many people would think that there is something wrong with you for putting your body through all that pain. My friends ask me why i run 10 miles, and believe it or not, i know why i do, i just cant give them a satisfactory explanation that seems logical. Your blog is called "the Logic of Long Distance" so i assume you believe that there is a logical, rational reason why we runners put ourselves through this kind of frenzy. I believe so too, but I've never quite been able to articulate it to my non-runner friends, or even to myself for that matter. Have any words on that? Well good effort grinding out a 6-mile uphill bonk. Ouch. You probably would have won if you'd run barefoot though. Hey Tera, my next post will be right on that subject. Thanks for asking!